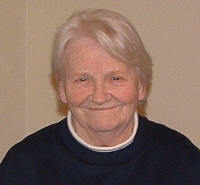 Rosalie E. Kuper, nee Franzke, 83, of Damiansville, died Friday, April 20, 2007 at Mar-Ka Nursing Home in Mascoutah. Mrs. Kuper was born April 1, 1924 in Berlin, Germany to Gustav and Elizabeth Marie (Schultze) Franzke; they preceded her in death. She married Leonard Kuper in 1956 in Berlin, Germany; he preceded her in death on May 13, 1991. Also preceded in death by a brother, Kurt Franzke, a sister Zenta Klavon, brothers-in-law, Ray Kuper, Jerry Kuper, Joe Kuper, and Bud Niehenke, and sisters-in-law, Loretta Kuper and Beatrice Niehenke. Surviving are her sons, Raymon (Caroline) Kuper of Lexington, VA, Jim (Lori) Kuper of Damiansville, and Robert (Emil) Kuper of Germany. 5 Grandchildren, Kurt Kuper, James and Benjamin Kuper, Katherina and Alex Kuper. A sister-in-law, Millie Kuper of Breese. A funeral service will be held on Monday, April 23, 2007 at 10:00 a.m. at the Moss Funeral Home in Breese with Rev. Gretchen Sterrett officiating. Interment will be in St. Damian Cemetery, Damiansville. Visitation will be Sunday, April 22, 2007 from 4:00-7:00 p.m. and again on Monday, April 23, 2007 from 9:00-10:00 a.m. at the Moss Funeral Home in Breese. Memorials can be made to Mar-Ka Nursing Home and will be received at the funeral home.